The History Department, together with the Philippine World War II Memorial Foundation (PhilWar), invites everyone to watch "HONOR: The Legacy of Jose Abad Santos" at Dizon Auditorium on April 10 (Wednesday) at 8:00 am and 10:00 am. 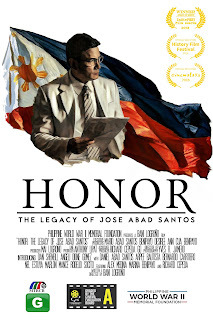 Given due recognition by Cinemalay, HONOR is a full-length documentary feature film directed by Bani Lorgoño about the life and legacy of one of the greatest Filipino heroes of World War II - Chief Justice Jose Abad Santos. More details here. Ticket price for students is Php100. Tickets are available at the College of Arts and Sciences Faculty Room. Admission is free for faculty and staff. For inquiries, please contact Ms. Jam Fernandez or Ms. Danes Calantuan-Mejos at 637-0912 local 277 or 278. 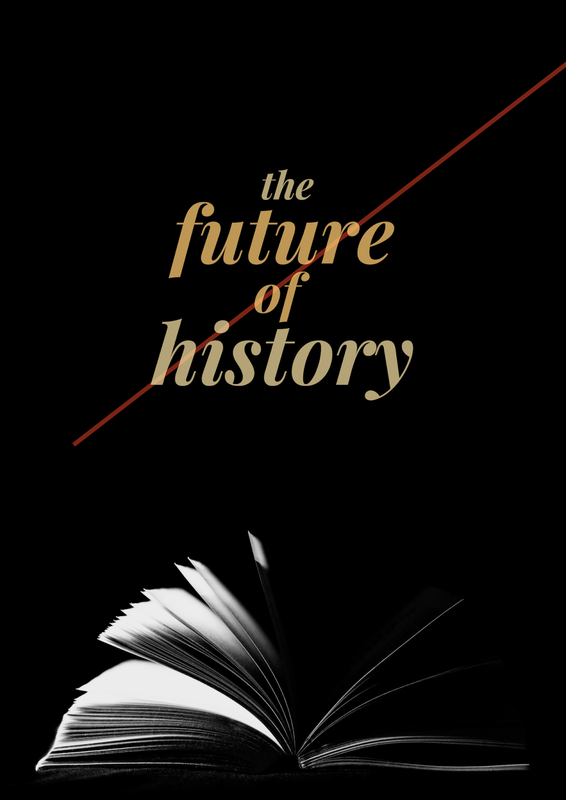 The History Department invites everyone to "The Future of History," the second get-together with Social Studies, Araling Panlipunan, and History teachers and coordinators from various schools at the Dining Halls on April 6 (Saturday) from 9:00 am to 12:00 pm. In light of the on-going K-12 restructuring of the entire Philippine education curriculum, the department has deemed it necessary to gather teachers handling History subjects in junior high school to know and understand the changes and development that have happened so far and to address the needs and challenges among students entering the higher education system. The History Department invites everyone to the 30th installment of the Humphrey Voices Series (HVS) entitled “Balangiga: Bells of History and Renewed Friendship” at Dizon Auditorium on March 7 (Thursday) from 1:30 pm to 4:30 pm. Atty. Floro Balato, Fulbright-Humphrey Fellow and former Provincial Administrator of Samar, will deliver a lecture. The program may be viewed here. The HVS is a forum wherein scholars, professionals, experts, students, and citizens freely discuss topics that affect business, environment, policies, health, and culture. The event will give UA&P students, faculty and staff the opportunity to know more about the Hubert H. Humphrey Fellowship, a 10-month non-degree academic study in the United States. More information is available here. Registration will start at 1:00 pm. An open forum will follow after the lecture. For inquiries, please contact Ms. Jam Fernandez at 637-0912 local 277 to 278. 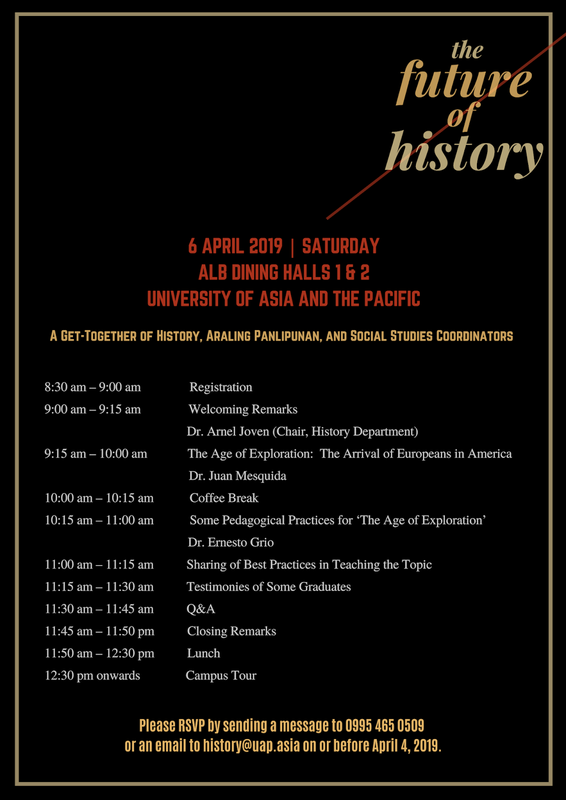 The History Department invites everyone to the Colonial Studies Colloquium on Rampage: MacArthur, Yamashita and the Battle of Manila at Dizon Auditorium on February 15 (Friday) from 9:00 am to 10:30 am. As part of his on-going book tour, James M. Scott will present a special lecture on his book Rampage: MacArthur, Yamashita and the Battle of Manila, which was named one of the Best Books of 2018 by the editors at Amazon, Kirkus, and Military Times. More details on his book tour can be found here. To commemorate the 74th anniversary of the Battle of Manila, Filipino college students are encouraged to participate in the nationwide essay writing contest. The mechanics can be found here. The poster of the event may be viewed or downloaded here. The History Department invites everyone to the Colonial Studies Colloquium on the Philippines and Chile at PLDT Hall on January 23 (Wednesday) from 11:00 am to 12:30 pm. Dr. Manuel Bastias Saavedra, Visiting Scholar from Max Planck Institute for European Legal History, will present his research project entitled “Frontier Law: Land, Territory, and Justice on the Edges of the Pacific World (Chile and the Philippines, 1750-1860)”. Registration will start at 10:30 am. The poster and abstract may be viewed or downloaded here. The History Department invites everyone to the Colonial Studies Colloquium on "Governance and Cultural Mediation in the Spanish Philippines" at Case Room 1 on June 27 (Wednesday) from 9:00 am to 12:00 pm. UA&P founding President Dr. Jesus P. Estanislao will present his paper entitled "Governance in the Philippines During the Spanish Colonial Rules, 1565-1898," an attempt at applying the modern governance framework to Spanish colonization in the Philippines. 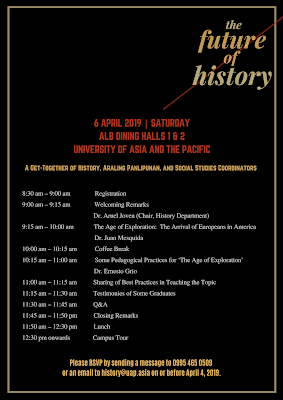 Dr. Diego Sola, a professor and postdoctoral fellow at Early Modern History Department, Facultat de Geografia i Història, Universitat de Barcelona, Spain, will present his paper on "The Role of the Augustinians as Cultural Mediators Between the Philippines and China in the 16th Century." Through documentation and missionary literature, this paper analyzes the mediating dimension of the Augustinians at a key moment in the cultural encounter between Western Culture and Chinese civilization. 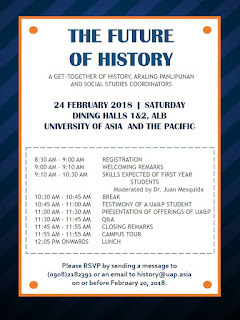 There will be reactors from the faculty members of the Departments of History and Asia Pacific Studies. The poster and abstract may be viewed or downloaded here. 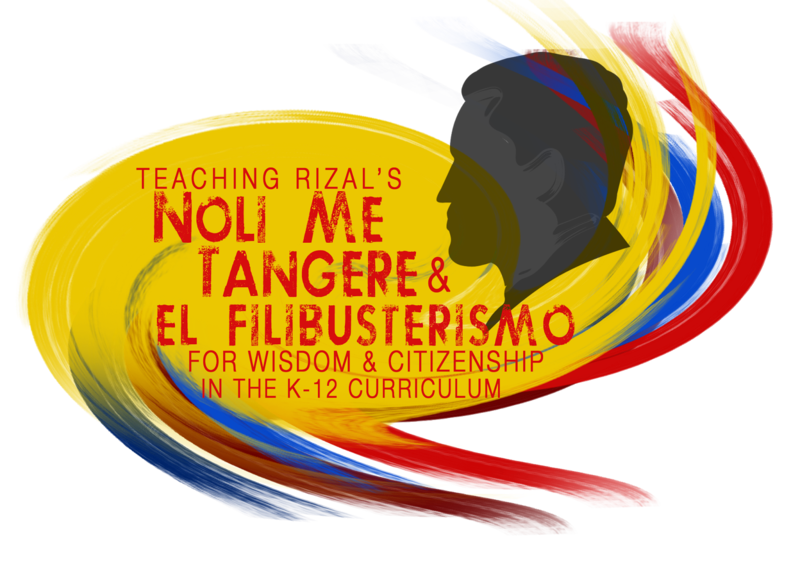 The Department of History invites everyone to the launch of The Nation as Project: A New Reading of Jose Rizal's Life and Works at Telengtan Hall on April 25 (Wednesday) at 3:15 pm to 4:30 pm, during the "Rizal's Ideas on Citizenship in Noli Me Tangere and El Filibusterismo" seminar-workshop for teachers. 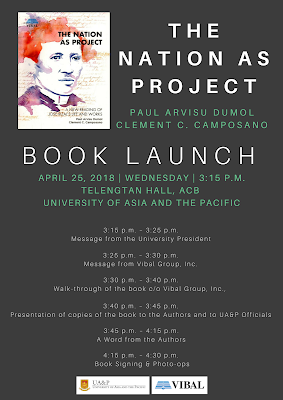 Published by Vibal Group, Inc., The Nation as Project is not another attempt at a reverential reading of Rizal's life and works. Although written primarily with Filipino students and teachers in mind, this is an attempt at situating Rizal in the nineteenth-century colonial context in the hope that this would allow readers to encounter Filipino nationalism as an artifact of the historical process. 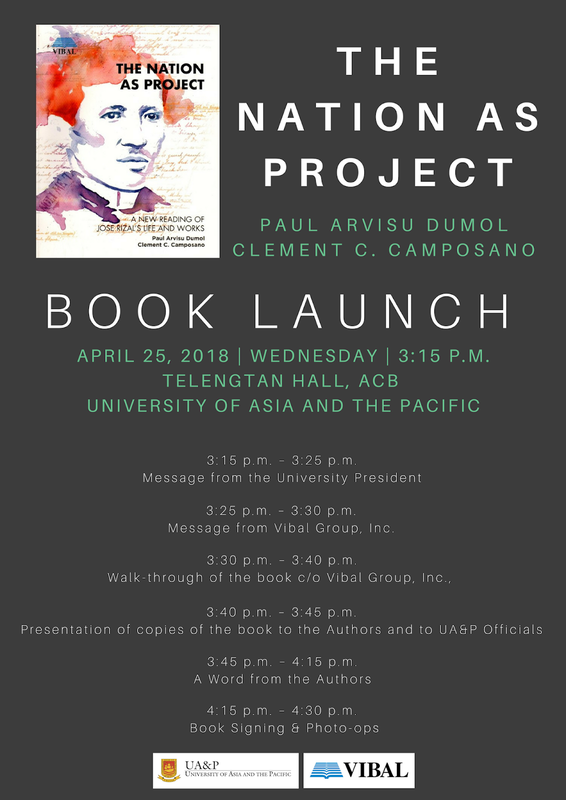 The authors, Dr. Paul A. Dumol and Dr. Clement C. Camposano, have been teaching the Rizal course for many years in the University of Asia and the Pacific. Their new book strongly reflects their ideas on Rizal's concepts of nationhood and citizenship. For inquiries, please contact Jam Fernandez at 637-0912 local 277 or 278. 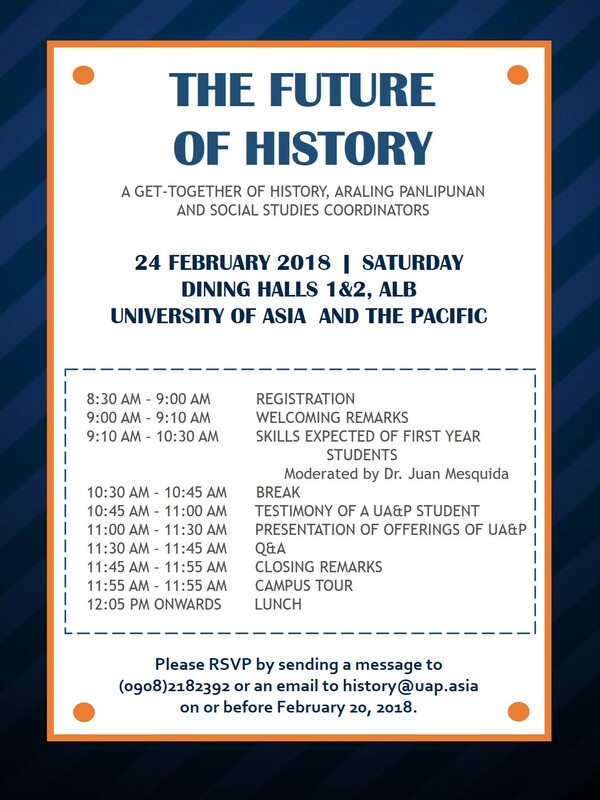 The History Department invites everyone to "The Future of History," the first get-together with Social Studies, Araling Panlipunan, and History teachers and coordinators from various schools at the Dining Halls on February 24 (Saturday) from 9:00 am to 12:00 pm. In light of the K-12 restructuring of the entire Philippine education curriculum, the department has deemed it necessary to gather teachers handling History subjects in junior high school to know and understand the changes and development that has happened so far and to address the needs and challenges among students entering the higher education system.